Klayman: Napolitano Obviously Wants to See Trump Fried by the Dems! The Two Faces of Fox News! Network Continues to Move Left! 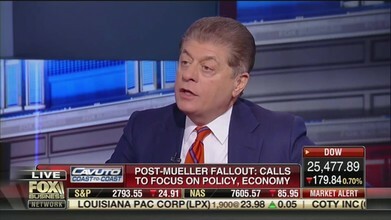 Fox News senior judicial analyst Judge Andrew Napolitano warned Fox viewers Wednesday that the still-unseen report from Special Counsel Robert Mueller likely contains evidence pointing to conspiracy and obstruction that Democrats will be able to seize on over the coming months and into the 2020 presidential election. Following the release of Attorney General William Barr's summary of Mueller's report that states the special counsel did not find that the Trump campaign conspired with Russia in its 2016 election interference, House Intelligence Committee chairman Adam Schiff (D-CA) doubled down on his claim that Trump colluded with Russia.